On the trip to the Chateau, we encountered a significant European storm of rain and hail and began to wonder if we really had to get out in it. To help our sense of wonder, we had the benefit of having free-spirited bus drivers with different ideas of exposing us to the beauty of France. One driver thought it would be fun to give us a sight-seeing tour of the French countryside to visit several historic Ibis Hotels in the area and have us guess which one was ours. Another driver, taking an altogether different approach, thought it would be good to wait on the Lord and tarry one hour on the side of the road until they heard from God. Having “tarried one hour” they strategically heard “The still small voice of God” through a cell phone that clearly directed their path and made it without further adieu. Another bus encountered the fire of heaven and engaged in its heat. We all rejoiced as we finally found our way to the hotels. The journey gave everyone a new appreciation for Proverbs 25:2, “It is the glory of God to conceal a matter, but the glory of kings to search it out.” Though relieved to finally have reached the hotel through these divinely escourted tours, we were surprised to find there was no room at the inn for some. Many began to wonder where the stable was. In the mess, God was waiting. In our exhaustion, weariness, and disarray, a miracle was birthing. As people began to get a grip on the reality of the chaos around us, a process of drawing out the Christ in us was birthing. The resources of heaven began to be pulled out of people to supply the lack. Servant spirits emerged to help others find food, rooms, transportation. Gradually the disappointment in wet cold sandwiches turned to thankfulness as people realized what they had was better than those from impoverished and persecuted nations around them. The fact that many in the world did not have a roof over their heads became a reality and irritation was replaced by thankfulness. God had a purpose in stripping us, to bring us to the end of ourselves, so that His resources could be uncovered and emerge. We were being tested to see if we would look beyond the mess to find the message from the Messenger. Would we rely on the love of Christ, the resources of His love and compassion to engage in the problems around us? The reality of the world we live in was cast before our eyes looking for the transformational leadership that would deliver us out of the chaos into His divine order and purpose. Remarkably, such qualities were drawn out of people in amazing and encouraging ways…God had our attention. The reality of His provision became evident as people began giving as there was a need. As morning dawned, a new day emerged as we spent some time in worship beginning a realigning process with heaven. This was greatly advanced through repentance. As worship and prayer, intermingled the reports, the atmosphere shifted. The sun came out and stayed with us for the remaining three days. As we began to express which “abomination” we were from, we quickly realized it didn’t matter, as relationships and the love of God broke through. Joy was frequently encountered along with tender, heartfelt tears as people met and ministered to one another. God took us out of darkness into His light, and from glory to glory. The meetings between challenges, spheres, and regions helped carry vision and strategy forward but more importantly relationships developed to strengthen a foundation for God’s Kingdom to advance. Deep questions were posed in conversations as to how to integrate the challenges and spheres in and between cultural groups. The answers to these questions were a gateway into future collaboration and strategies that will emerge as we continue to press through for Kingdom advance. With the reality of the enormity and complex nature of the world we live in expressed through the challenges, spheres, and regions, the issues were released through many powerful and poignant moments before The Lord. Our prayers intermingled with worship put the issues under His feet. The import of taking the challenges we face before the Lord was accentuated by a low flying jet interrupting the North American regional presentation. Such incidents cannot and should not be easily cast off. Such incidents are daily a reality in nations like the Ukraine, Israel, Egypt…but in the middle of France, in the morning, directly over our heads?! Interestingly, it happened right after the report from the Ukraine (the East) where war is rising and during the North American presentation from the West. What was the message? In discussions with several others, we sensed it was a distinct wake up call at the very least. Time is short. War is rising and it will come from the East to the West. Things are going to happen suddenly both from God and from the enemy. Do not mistake the import of the gathering and that we must press forward for the sake of His Kingdom. The warning has sounded! It was a direct message to the gathering to awaken the church with visionary focus, and empowered mobilization forward. 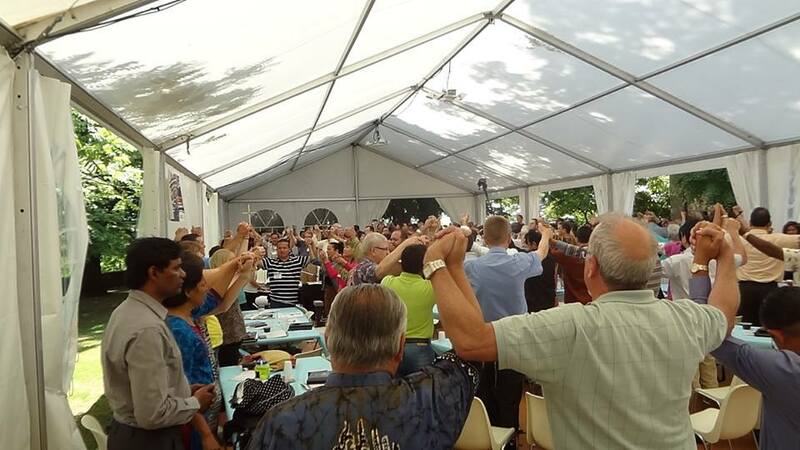 As poignant moments, worship and prayer helped refresh and strengthen the participants, the summit came to a close with joyful dancing. The breakdown of “abominational” divisions through love and deepening relationships was poignantly demonstrated as people from across the nations joined together in dance, even an Egyptian coptic priest danced to Israeli music. Joy filled the atmosphere. The summit closed with a deeply moving and powerful prayer for those in the persecuted church. Truly a remarkable summit that was transformational for us all. God’s ways are not our ways, but they are always the best ways. He knew what we needed and had most unusual ways of achieving it. We are all better, more connected, and more transformed because of it. • As times intensify it will be vital to be purposefully linked…the stronger the relationships, the stronger the Kingdom advance. • When encountering the storms and chaos, look beyond the mess to the Messenger, He will make a way and it will always be better than our ways. ** God moving: US House of Representatives: Kevin McCarthy (R-Bakersfield, CA) is suddenly favored to take the US House of Representatives house majority leadership after defeat of Eric Cantor in the primaries. Kevin is a strong Christian conservative. ** Enemy attack: Ninevah, Iraq, 99% of Christians in Ninevah have fled under threat of ISIS islamic control and threat. As we go forward, may His love surround and His joy propel you in His strength.